Nedbank’s Chief Economist Dennis Dykes says the Finance Minister Tito Mboweni‘s budget presents the best solutions under the current difficult economic situation. Dykes has attributed the deterioration in government finances to on-going measures to support Eskom. Mboweni has announced R70 billion to assist Eskom to pay its debt over the next three years. This translates to R23 billion a year. Dykes says Mboweni faced some difficult choices. The United Democratic Movement has expressed mixed views about Mboweni’s Budget Speech. The party says it is alarmed that Mboweni made no mention about Expropriation of Land Without Compensation. However, UDM Deputy leader Nqabayomzi Kwankwa says the party welcomes the strict approach on giving out guarantees to state-owned entities. Economic Freedom Fighters (EFF) leader Julius Malema says Finance Minister Tito Mboweni’s Budget Speech was completely flawed and repetitive. Malema says the minister has neglected to give a clear plan on job creation and the reduction of Value Added Tax (VAT), which currently sits at 15%. Meanwhile, Democratic Alliance (DA) leader Mmusi Maimane has criticised the Budget Speech saying it lacks a comprehensive plan to fix the ailing economy. Mboweni said the economy was expected to grow at around 1.5% – way below the 5% required to make a substantial dent in unemployment and inequality. 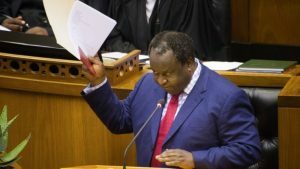 Mboweni announced a R1.8 trillion budget focused mainly on social development. However, Maimane says Mboweni seems to be distancing himself from fixing the challenges faced by state-owned enterprises. The Freedom Front Plus has raised concern about a number of points in the National Budget tabled by Minister Mboweni. The party says the early retirement of public servants and the current debt levels are concerning. The African Christian Democratic Party says it is concerned about the increase in the country’s budget deficit and the high government debt. The post Mixed reactions to Budget Speech appeared first on SABC News – Breaking news, special reports, world, business, sport coverage of all South African current events. Africa's news leader..